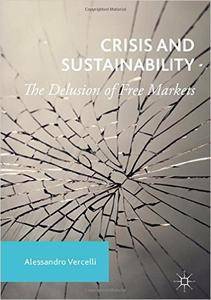 Alessandro Vercelli, "Crisis and Sustainability: The Delusion of Free Markets"
This book offers a novel interpretation of the Great Recession and the ensuing Euro Crisis as a consequence of the evolution of capitalism since the 1970s. Chapters argue that the neoliberal development trajectory pursued in recent decades is unsustainable, and posit that neither sound macroeconomics nor empirical data support the unqualified faith in free markets that inspired it. The book begins by providing a broad critical perspective on key concepts such as freedom, free market, free trade, globalisation and financialisation, before going on to analyse the long and deep recent crisis as a result of the neoliberal policy strategy adopted since the early 1980s. The alternative narrative outlined in the book provides insights into the policy strategy required to achieve a sustainable development trajectory.